Another backwards approach to solar? 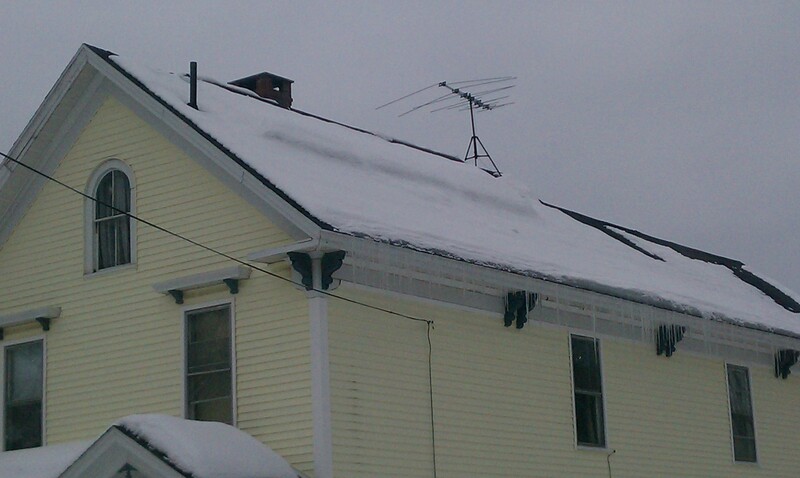 In this photo, buried under the snow, is an even bigger solar thermal array than the one shown yesterday. 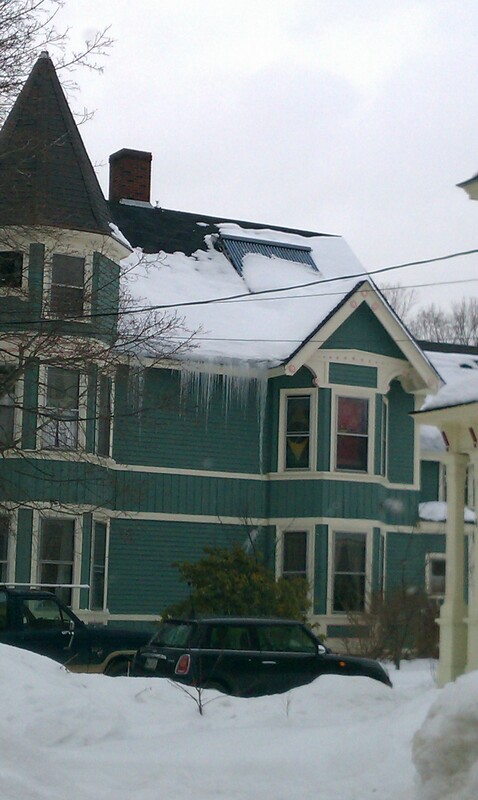 And on the roof we see not only some snow melt problems which suggest a heat loss problem, but also the makes of an ice dam problem. Looks like someone missed insulating a couple of bays. We sure would like to see the basic integrity of the house addressed before installing what was likely a pricy solar system. When there are weakness with the home’s air-leakage and insulation, the savings from efficiency generally make more sense than trying to solve the problem with renewables. Plus, the more efficient the home is, the smaller the solar system you need. Again, it pays to think “efficiency first”. If you’re thinking solar, it’s wise to start with a good home energy audit and tackling many of the energy savings opportunities before investing in solar. Solar hot water can be a smart option. Scott Adams’ WSJ article continues to keep me thinking… in it he talks about the solar photovoltaic array he installed on his roof, and his disappointment with the results, or rather the lack thereof. According to Wikipedia, Scott lives in Pleasanton, California. If you’ve ever been to Pleasanton you’ll know that it is a fairly sunny place with a pleasant climate (perhaps why it’s called Pleasanton). A photovoltaic array probably seemed like a good idea. An even better, and less expensive, idea might have been to install a solar hot water system on the roof. Pleasanton has an average temperature of about 63 degrees Fahrenheit, which means the water that comes out of the taps is around that temperature. This is because water pipes are buried a few feet below the surface of the ground, where daily fluctuations are negligible and seasonal effects are minimal due to the insulation afforded by the soil. If you want to know the average temperature where you live, stick a thermometer in a glass of tap water (taken after the faucet has been flowing for about a minute), it should be fairly close in the lower latitudes of the continental US. If you live up north you will probably notice some seasonal effects (i.e. your tap water is a little cooler in winter and a little warmer in summer). The upshot of this is that in Pleasanton homeowners typically use fossil fuels to heat water from ~63 degrees to the temperature of choice for clothes washing, dishwashing and showering, somewhere around 100 degrees. Solar hot water lets the sun to do some of the hard work – heating the water from 63 degrees to say, 90 degrees – and relies on fossil fuels to kick in for the final push to ~100 degrees. In this example the sun has done almost three quarters of the work, which would reduce your expenditure on water heating by almost three quarters. Solar hot water can reduce water heating expenditure by nearly 100% in favorable regions in the summer months. In Pleasanton we would expect annual saving to be on the order of ~70 – 75% of water heating costs. Given that 14 – 25 % of energy consumed in the typical home is used to heat water, this could result in significant savings. Of course the suitability of your house for a solar hot water system depends on many factors and only a qualified professional, such as those at GreenHomes America, can tutor you on the best options for your building. Having said that, here is a link to a quick video tutorial on solar hot water from our V.P. Mike Rogers. Maggie Maurer is out at the GreenHomes booth at the New York State Fair in Syracuse, and she reports that a lot of folks are stopping by with great and serious questions (and some just want a lollipop!). It’s super to see people taking a strong interest in energy-efficiency. The biggest questions yesterday were about high-efficiency furnaces eligible for the federal tax credit through the end of the year and solar hot water. We’ll see what the rest of the week brings. 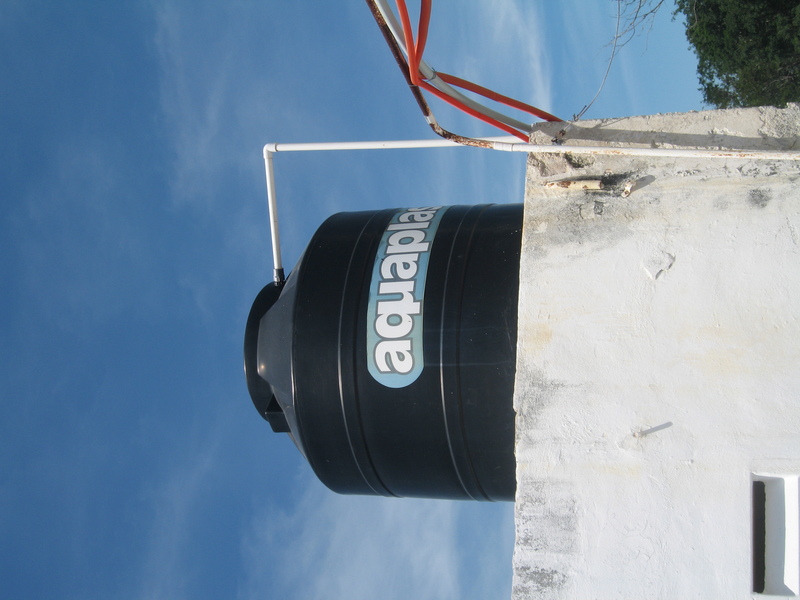 While in Mexico last week, I noticed a smart solar hot water collector on many buildings. In a climate with little chance of freezing temperatures, solar collectors don’t not freeze protection, and this simplifies things considerably. As long of the roof is strong enough, a large black tank will do the job. Cold water comes in, hot water goes out. And the consderable mass holds the heat through the night. There are some design limitations, but this is a simple, inexpensive approach that can be adopted broadly in warm climates. We’ve collected several of our initial video which illustrate various home energy topics in both our video library and on You Tube. You can find out about home energy audits, replacement windows, air-sealing, solar hot water, with plenty of more topics on the way. Hope you find it helpful–and bookmark it if you do! According to the U.S. Department of Energy, as much as 250 billion kWh worth of hot water is sent down the drain. We pay to heat water, and then we pour it down the drain. That’s not good. Fortunately, a good percentage of the wasted energy is recoverable. GFX installed in the drain of a home pre-heated incoming cold water and lowers the energy needed to provide hot water for your home. Several manufactures make version of drain water heat recovery systems—and one class in particular seems best suited. These are gravity film heat exchangers, or GFX. Water flowing down a drain pipe tends to cling in thin a film to the sides (not fall down the middle as you might imagine. We can take advantage this to “grab” the heat from the waste water and add it to incoming water. The two streams are separated by two walls of copper, so your incoming water is not fouled by the outgoing water. In the photo, you see an actual installation (from my basement!) of the GFX, with the cold water inlet in the blue box, and the preheated water outlet in the yellow box. The savings you’ll see depend a lot on whether you use batches of water (like baths, dishwashers, clothes washers) or whether the water drains as you’re using it, as is the case with showers (these simultaneous uses deliver the best recovery). Depending on how you use water, you could save between 20-40% on hot water costs with a GFX, all from a piece of equipment with no moving parts, that uses no electricity, and that should last 50 years. The GFX system can be a good complement to high-efficiency water heaters and solar hot water systems. 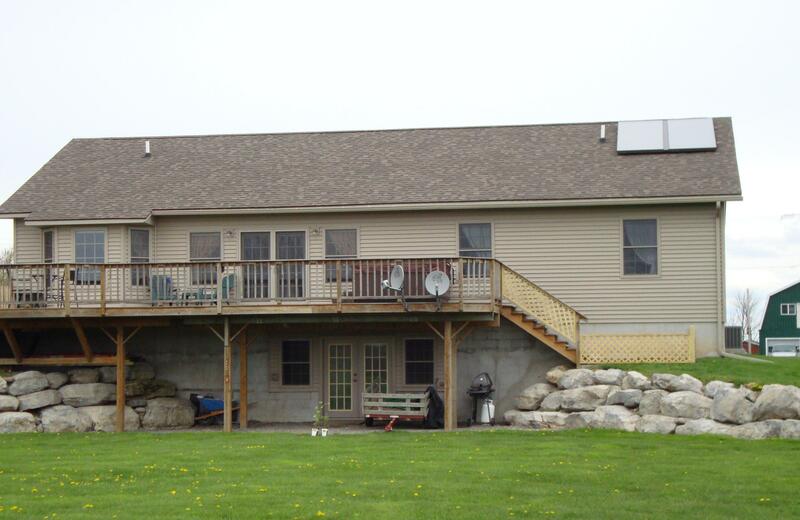 There are some installations challenges in existing homes, and especially in home built “slab on grade”. There are also a variety of installation considerations to optimize performance. But for many homeowners–especially those who have teenagers with a proclivity for hour-long showers!–GFX can be an attractive option. 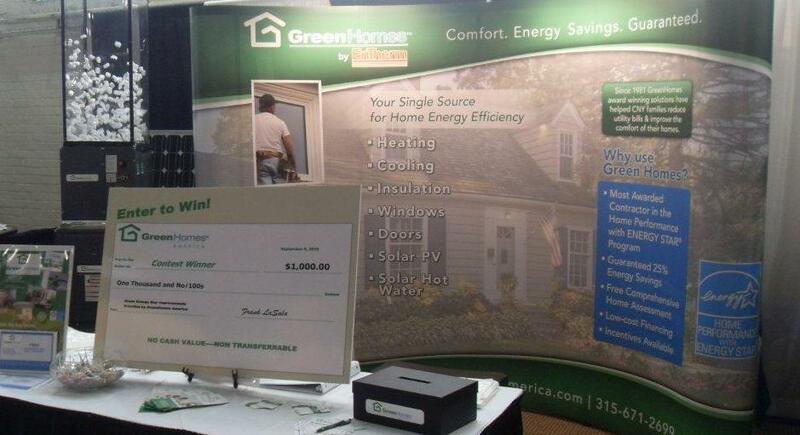 New York residents, GreenHomes will be in the New York State Fair in Syracuse. Look for us in the Center of Progress building, Booth 1. We’ll have folks on hand to talk about energy-efficiency and renewables like solar hot water, solar PV, and geothermal. Whew–homes and multifamily buildings sure have a long way to go in terms of both water-efficiency and hot water efficiency. So much of the water the typical home pays to heat gets lost down the drain after it’s cooled in the pipes and waiting for more hot water to arrive. Ever turn on the hot water tap in the morning and what 20 seconds for hot water? 40 seconds? A couple of minutes? It shouldn’t be that way. Waiting and wasting: two problems that can be greatly reduced by proper equipment choices, placement, and plumbing. Easier in new construction BEFORE goofy piping runs are in place, but existing homes can also benefits from tweaking (or overhauls! ).